The Dalai Lama is the spiritual leader of Tibetan Buddhism. 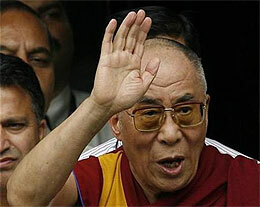 The present Dalai Lama, Tenzin Gyatso, won the Nobel Peace Prize in 1989. He travels the world, teaching Tibetan Buddhism and talking about the importance of compassion to find happiness. My first impression of the Dalai Lama's hand print is a sense of balance, especially the balance offered by the mounts of Venus and Luna (Moon), the two mounts at the bottom of the palm. In this case, the peaceful Moon shows an accurate perception of the wolrd, while Venus shows a healthy appreciation of the senses and respect for the body. The impression of balance is also given by the straight fingers, as well as by the ring finger and index finger being of equal length. Interestingly, on the photo, the thumb is held in, instead of being stetched out. At this precise moment in time, there was a certain sense of helplessness, which indicates he was not at his best! The head line crosses the center of the hand horizontaly, then goes diagonally into the Moon. 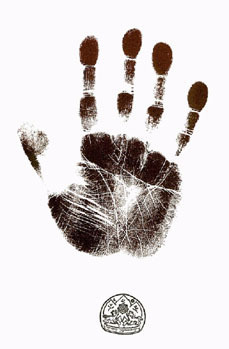 This type of line is often visible on the hands of renunciants. Being very long, this line suggests a lot of mental resilience, a very useful quality for someone who has be in exile most of his life. On the Mercury mount, just under the baby finger, you can see the small vertical lines called "healing stigmata". One doesn't need to be a healer to have those lines. But anyone who has them will be able to give physical, emotional, mental, or spiritual comfort. The love of truth line, a vertical line just under the middle finger, reveals a deep connection with the truth and a receptivity to others' opinions. Finally, the finger tips, in the shape of spatulas, are a sign of spontaneity and enthusiasm, which has been instrumental in the Dalai Lama's work.